The strong bullish rally continued yesterday with a wide spread up bar, which was given a boost last night with the economic news released in Japan showing that the economic crisis has deepened, with exports falling by a massive 46% in January from a year earlier, leaving the country with a record trade deficit. The dramatic fall widened Japan’s trade deficit to ¥952.6bn (£6.75bn), the fourth deficit in as many months, and the biggest since records began in 1979. The world’s second biggest economy now finds itself in the unusual position of begging its major trading partners not to implement protectionist measures, causing exports to slump further. With such a big rise yesterday do not be surprised to see some profit taking today, but expect further rises in the next few days. 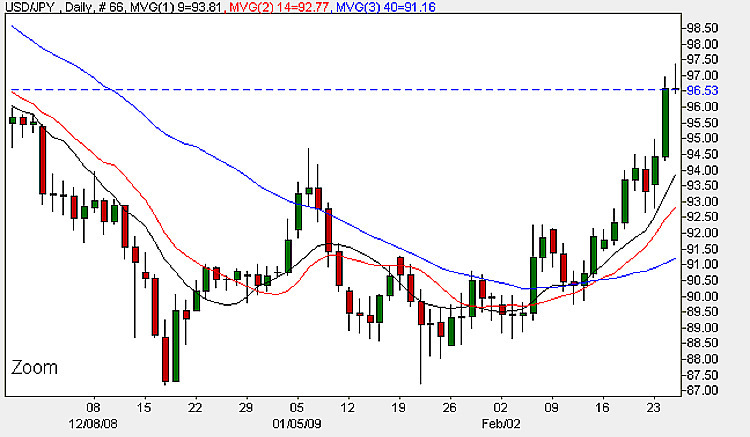 If you have open positions as I have, then move your stops up below yesterdays open, and wait for a move higher. My initial target is $98.50 and then a move to $100 and above if this region is breached.If you have no positions open, then I would suggest that today may present a buying opportunity on any reaction lower, so I would wait for a fall in the hourly charts, and for a bullish signal to buy. The fundamental news today is back to Bernanke ( who else!) as he is speaking this afternoon as he is due to testify on semi-annual monetary policy report before the House Financial Services Committee, in Washington DC. The testimony usually comes in 2 parts. First he reads a prepared statement (a text version is made available on the Fed’s website at the start), then the committee will hold a question and answer session. Since the questions are not known beforehand they can make for some unscripted moments that lead to heavy market volatility in this and other currency pairs, as well as the equities and bonds markets. Please don’t underestimate the power that a few words ( or even one word ) can have – yesterday it was the ‘if’ word which caused equities to rebound higher and metals to fall. The short term and medium term is bullish, the long term is sideways.